​It is your time to create a story about Roger, a metamorphic rock. You must describe at least three transitions that Roger goes through during his life, such as changing from metamorphic to igneous, igneous to sedimentary, and sedimentary to igneous. You have the option of writing a diary, creating a cartoon, or making a children's book. This project will be due next Friday, March 3rd. Directions for Journey on the Rock Cycle: It is your time to create a story about Roger, a metamorphic rock. You must describe at least three transitions that Roger goes through during his life, such as changing from metamorphic to igneous, igneous to sedimentary, and sedimentary to igneous. You have the option of writing a diary, creating a cartoon, or making a children's book. This project will be due Friday, Feb 24th. Warm up: A seeker or lover of wisdom is a ___________. ​Warm up: Which of the philosophers that we discussed had the greatest impact on the Greeks? Also complete the handouts from yesterday. 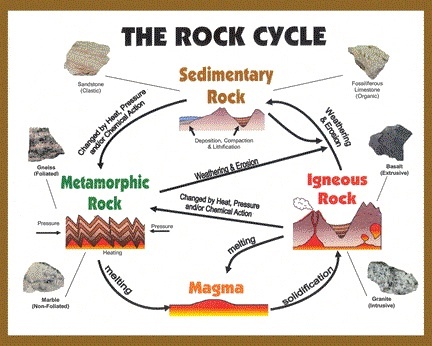 Complete the journey on the rock cycle handout for your project that is due tomorrow.